At the Lucena Hotel our highest priority is to assure that you have an enjoyable, friendly and welcoming experience at our accommodation. The hotel managers, Richard and Lynn would like to welcome you to the Lucena. 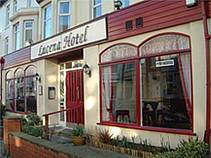 We take pride on the high standards and friendly service we provide at the Lucena Hotel. We have recently gained accreditation, our hotel lives up to Stay Blackpool’s inspection standards; our main aim is the customer comfort and the cleanliness of our rooms. The hotel is licensed and you can enjoy drinks in our newly refurbished late bar. We also have a relaxing, spacious lounge area. Where you can take a break. Place Categories: South Pier, South Pier Couples, South Pier Groups and South Pier Stag & Hen.